Because Ms Trouble is not here, I'm hijacking this blog. So get ready for yet another incomprehensible religious post. On December 15, our local shrine, Futaarayama in Utsunomiya, performs a ritual ceremony. It is called “Otariya (おたりや／オタリヤ) and takes place twice a year. I, as a certified matsuri and Shinto otaku, (of course) had to go there. On January 15, 2010, we were there (of course) and you can take a look at our old post here. Before going into detail about this festival, I just want to describe my thoughts and give a few insights into our love of matsuri, since I believe it’s indispensable. In the past, shrines and temples, in other words, priests and monks, used to have a great influence on the society of Japan, with political decisions included. So, pretty much like in other place in the world during ancient times. 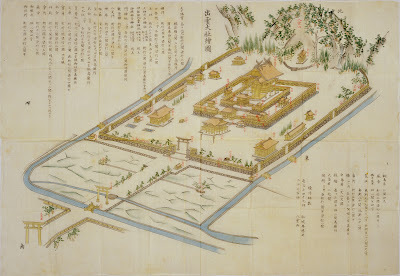 These two religious (= political) powers had an almost unlimited budget, which was explained by the facts that the biggest and the tallest buildings starting in ancient times all through the Middle Ages were all shrines and temples, for instance, To-daiji temple Daibutsuden Hall (東大寺大仏殿), where Daibutu is sitting, is 49.1m tall. The original To-daiji temple complex had two pagodas that were 100m tall!!! To-daiji Daibutsuden Hall (57.5m x 50.5m x 49.1m/Width x Depth x Height). 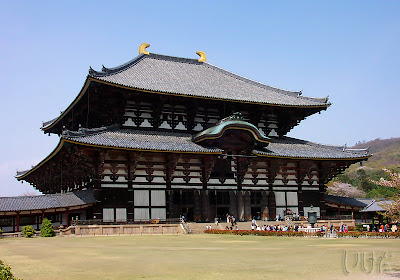 OK, To-daiji is Buddhist. What about a Shinto example? According to the textbook called Kuchizusami/kuyuu (口遊), filed during the Heian Period (平安時代) by Tamenori Minamoto (源為憲) in A.D. 970, Izumo Taisya Main Hall (出雲大社本殿) was 48m tall in Ancient Ages. In the Early phase of Ancient Ages, it was even taller, 96m!!! 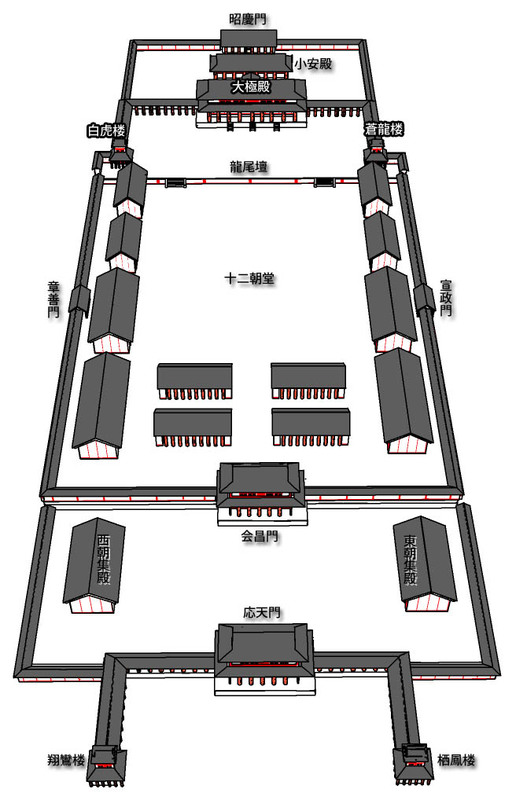 Schematic representing the Izumo Taisha shrine complex. The Main Hall is located in the center. 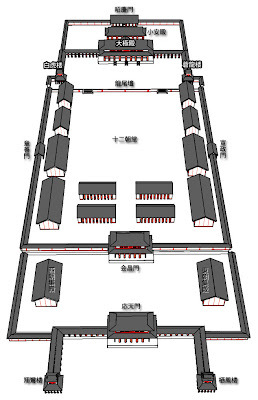 The Main Hall of Izumo was even bigger than the Taigokuden Hall of Kyoto Court in Heian Period (平安京大極殿), according to Kuchizusami (口遊). This was where the ritual ceremonies organized by the government in power were held. In ancient Japan, the religious powers had surpassed the Kyoto Court! Shinto is said to have 8 million of deities. Although I haven’t counted the exact number of Shinto deities (though I’m trying, trust me), I understand that the number “8 million” signifies “plenty or numerous” – Polytheism (多神教), so to say. Most of Shinto gods are ancient Emperors, relatives of the Royal family, and their counterforce. Many of them are real historical figures. Yes, Shinto Gods are all dead, of course. I think most of you guys agree with Nietzsche's view that; recent developments in modern science and the increasing secularization of European society had effectively 'killed' the Christian God, who had served as the basis for meaning and value in the West for more than a thousand years. Nietzsche claimed the death of God would eventually lead to the loss of any universal perspective on things, and along with it any coherent sense of objective truth[Lampert, Nietzsche's Teaching, 17–18; Heidegger, "The Word of Nietzsche."]. Instead we would retain only our own multiple, diverse, and fluid perspectives. This view has acquired the name “perspectivism” Alternatively, the death of God may lead beyond bare perspectivism to outright nihilism, the belief that nothing has any inherent importance and that life lacks purpose. (From Wikipedia- Friedrich Nietzsche). And that applies to Japanese society that two religious powers are struggling to maintain or not to lose their prestige and influence on the society. Matsuri is the opportunity to reproduce the meaning and value that used to be valid eons ago. However, currently matsuri are also under a strong influence of secularization and becoming like the Olympic Games. The significance of matsuri, the meaning of norito (祝詞) and manners of ceremony are now described as a “bugs” and therefore lost in translation in many cases. What the two religious giants are doing now is to organize traditional and ritual ceremonies as often as possible and remind us of the incidents described in Japanese myths, or at least - in local accounts. Unless they provide us with a new and attractive paradigm, which I don’t think they can, they got to keep organizing routine ritual ceremonies. But still, it’s a lot better than quitting and creating a gap between Japanese myths and our future. That’s why we go to matsuri and eyewitness everlasting traditional ceremonies.